“Back to basics” could be the strapline for this cruise. 50 years ago, Peter Martinek had the idea of using simple means to convert wooden cargo vessels into passenger ships and to run cruises in them – the “Seeadler-Kreuzfahrten (“Sea Eagle Cruises”). .In 1965 the first three ships set sail with holidaymakers on board – there were “berths” separated by curtains, and the only shower was an open one at the stern. For that reason it wasn’t permitted then either to “shower naked in ports”. At that time, on-board conviviality was the order of the day, a lamb would be roasted on the open campfire, the guests would spend the night in secluded bays, and the starry sky would turn the sundeck into the most luxurious bedroom of all. 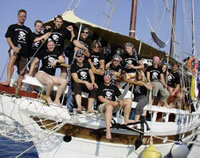 And it is exactly this kind of travel that we are now reviving under the name of “Pirate Cruises”. And which ships could be better suited than the two smallest in our fleet – Otac Luka and Vila? Of course the “berths” have long since been replaced by cabins with washbasin, and air conditioning in the cabin aisles ensures that the temperatures remain bearable even in mid-summer. And you won’t find the open shower on deck since there are now three showers/WC on board. But what has not changed is the conviviality, and, if you bring your sleeping bag, you can finally once again enjoy the starry skies. 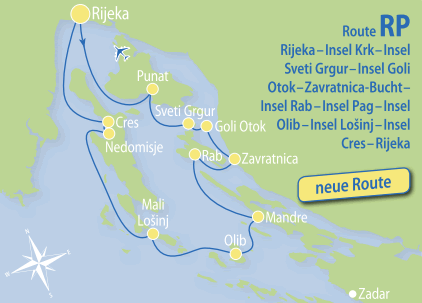 Between 11:30 am and 1:00 pm, embarkation at the port of Rijeka. If you are coming by car you can drive into the port from 10:00 am. Our service team will then direct you to the garage and transfer you back to the port. After embarkation our guide will greet you with a welcome drink, and you will have a chance to get to know the crew and your fellow passengers. After a snack on board we weigh anchor and head off for the island of Krk which, with an area of 405.78 km 2 , is exactly the same size as the island of Cres. 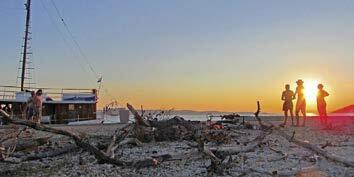 Cres and Krk thus share the honour of being the largest Adriatic islands. Our first stop is a secluded cove, where you will for the first time be able to dive into the wonderful waters of the Adriatic. We then cruise to Punat on the island of Krk, situated in a sheltered, almost completely enclosed bay. There follows dinner on board and an overnight stay. Our first port of call is the island of Sveti Grgur. Beautiful bays, beaches and forests, a goodly number of fallow deer and the ambience of pristine nature attract many tourists and day trippers. Today, the remains of the former Gulag for women with approximately 50 bunkers from that time, well hidden in the rocky landscape, bring back memories of a sad past. There follows a stay of about three hours, with an opportunity to explore on your own or take a refreshing dip. After lunch on board, we head off past the sheer cliffs to the island of Goli Otok oppo - site, which served as a prison and labour camp for men until the late 1980s and is now uninhabited. By the way, the name means “Naked Island”, because it is quite barren and offers little shade. Once we have dropped anchor here, the next job will be to collect wood for the barbecue. While the captain is grilling the lamb, we have the opportunity to take a look at the island or go for a ride on the “Goli Express” miniature railway (seasonal). This is followed by dinner on board – grilled lamb on a skewer is a real treat. First of all we take a detour to the mainland, to the fjord-like Bay of Zavratnica, surrounded by towering cliffs of up to 100 m in height. The bay is about 1 km long and between 50 and 150 m wide. Then we set a course for the island of Rab and call into the capital of the island, which bears the same name. The old town of Rab with its striking bell towers extends along a narrow and rocky peninsula, surrounded on two sides by water. Three roads run through the old town – the “Low Road” (Donja ulica) with its cafés and bars, the “Middle Road” (Srednja ulica) with boutiques, souvenir shops and ice cream parlours, and the “High Road” (Gornja ulica), which leads to the four churches with their bell towers. We use the approximately two-hour break to stock up on water and buy bread while you go for a stroll through the old town. There follows lunch on board while we set a course for the island of Pag. After a break for swimming in a cove, we call into the fishing village of Mandre. Anyone who wants to can take a taxi from here to the famous beach at Zrće with its round-the-clock parties in six clubs (mid-June to early September). There follows dinner on board and an overnight stay. After an hour or so’s cruise we reach the Bay of Slatinica on the island of Olib, where we drop anchor for an extended bathing break. There follows lunch on board before we call in at the small harbour of the only village on the island, Olib, in the afternoon. The island, together with Silba and Premuda and several smaller uninhabited islets, forms an archipelago on the border between Dalmatia and the Kvarner Gulf which belongs officially to the city of Zadar. Olib has only about 150 permanent residents, who mainly earn their living from olive-growing and a little agriculture. In recent years, the islanders have returned to some traditional ways, including the ancestral extraction of sea salt without salt works and the use of seaweed to make cushions and mattresses. 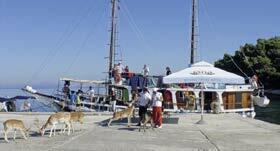 There is an opportunity to visit the olive oil mill and the “Kaštel” fortified tower, built in the 16th century as protection from pirates (admission approx. € 2.70 or € 4, payable on site). There follows dinner on board and an overnight stay. We pass by the islands of Silba and Ilovik and set a course for one of the bays of the island of Lošinj. With a little luck we may be able to watch dolphins playing in the waves, since the waters around the island of Lošinj are home to more than 160 dolphins registered with the “Adriatic Dolphin project”. Today, the captain will let us decide whether we want to wait before calling in at the port of Mali Lošinj in the late afternoon for an overnight stay or whether we would like to visit Mali Lošinj in the early afternoon and head to a nearby bay for an over- night stay after roughly two hours in the town. There follows dinner on board and an overnight stay. Today we head to the neighbouring island of Cres, which is connected with Lošinj by a swing bridge at Osor. Striking features of the island include the endless olive groves and countless flocks of sheep. Below the village of Lubenice, situated on a rocky ridge at an altitude of 378 m, we drop anchor in the Bay of Žanja with one of the most beautiful pebble beaches on the island of Cres. However, the real attraction of this bay is the “Blue Grotto”, which is accessible only from the sea. It is a unique experience to swim into the grotto, the interior of which is bathed in turquoise at about noon by the sun’s rays which penetrate through an aperture about three metres below the surface. There follows lunch on board; in the afternoon we continue to the sheltered Bay of Nedomisje just before the town of Cres, where we will also stay overnight. After breakfast we leave for the town of Cres which we reach after a voyage of just under half an hour. We have about two hours to explore the town and have a cup of coffee before we set sail again for the last bay on our cruise. After an ample break for swimming and sunbathing we then weigh anchor once again and set a course for Rijeka, arriving at around 5:00 pm. There follows dinner on board and an overnight stay. Sveti Grgur, the deer come up to the ship.